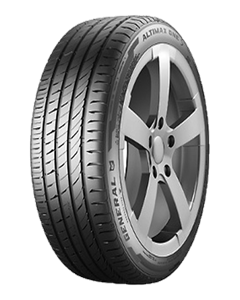 General Tire‘s new Passenger Summer line that provides a reliable performance for everyday driving with outstanding grip in dry and wet conditions and significantly improved tread life. This new tyre is designed in a whole new way - its connected shoulder blocks with added stiffness provide precise steering response, powerful grip and safe, reliable braking performance for everyday driving. Optimized siping and a large number of gripping edges effectively displace water for responsive handling and enhanced control on wet and slippery roads. The new silica-enriched tread compound and the computer-optimized pattern design enable you to gather more miles thanks to minimized wear-causing distortion. Benefit from the extended tread life that leads to extra miles! If the tread wears unevenly over the first 1,000 kilometers, the Visual Alignment Indicator technology (VAI) signals this to the user. This significantly extends the service life of the tyre.